Welcome to Fred’s Tiny Houses off-grid display at Sustainable Living Festival 2019! How to recognise a well-built trailer. Interviews with awesome DIY builders. How to get a truly insulated floor. Get HEAPS more storage in your tiny house. 17 minute documentary on this house. Brochure of specifications and features. VIDEO: What makes our trailers strong, safe and better to live on. 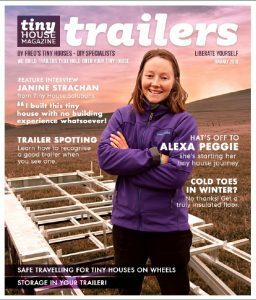 MAGAZINE: Get a beautiful Tiny House Trailer magazine for FREE! Choose the best trailer size for you. Compare trailer specifications and prices. Save yourself years of research by attending a weekend of workshops on how to build your own tiny house. Read about the tiny house regulations in your local council area. Upload and share information you find about your local area. One place where you can find everything you need.